People everywhere have local customs, and some of those from my youth in the oil camps in west Texas i’ve never seen elsewhere. One of them was burning your lawn in the winter. It was pretty much universal in those oil camps in the late forties and early fifties, and i’ve found references to it online, but i’m not sure it was all that widespread elsewhere. The grass used for lawns out there was Bermuda, and it spread mainly by runners at and below the surface of the ground. It also died at the first frost, and since the west Texas winters were dry, it was very easy to set alight. Since it had been mowed short until the frost killed it, the flames remained quite small and were thus easy to control in case they threatened a structure. The downside, of course, was that your lawn was black instead of brown. More importantly, if Something Happened and the fire spread to a patch of grass that had been left uncut, it could set something else on fire. Like your house. The stated reason for burning the lawn was that it was good for the lawn, that it provided nutrients and reduced the thatch so the grass would get green earlier in the spring. And yes, to a very minor degree it had those benefits. In my old age now, though, i realize that the main reason for burning the lawn was that guys like fires, which is why it was always the men who took care of this chore. Besides that, kids love fires, and the winter lawn burning was a Major Event eagerly anticipated by the children. Here’s a modern San Francisco “custom”. 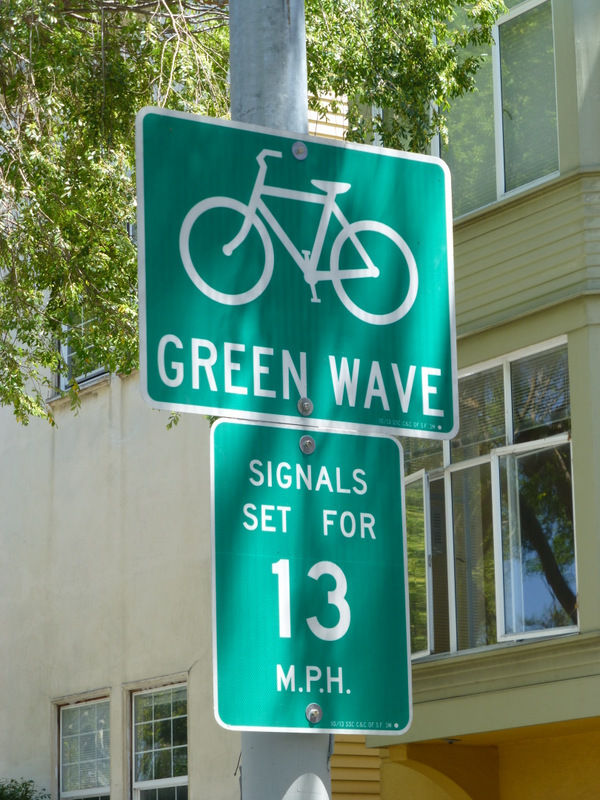 On some major bicycle routes, the traffic signals are set to a bicycle-friendly rate.